Everyone loves a cheering crowd! 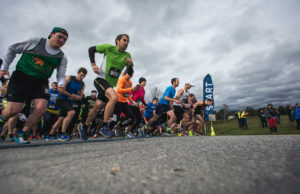 The Vermont 10 Miler course is a very challenging, looped course; participants will be thankful to have spectators giving them a boost along the way. Hand-operated noisemakers such as cowbells, funny costumes, music, and signs are great ways to cheer on all of the 1,800 participants. We ask that spectators avoid driving on the actual course as much as possible — when able, please take alternate driving routes to the spectator spots! 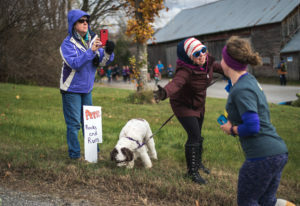 With ample parking at the Mayo Farm Event Fields, the start is a great place to cheer on the runners as they head off into the first mile of the course. There’s even a red barn in the background of the starting area, making for those ideal pre-race snaps! Remember to use #Vermont10Miler when posting your pics for your chance to be featured on our Instagram and Facebook pages! Just after mile 2, runners will have just completed the steepest portion of the course, and they’ll need encouragement to finish the rest of the uphill climbs before the downhill section! Spectators can leave from the Mayo Farm Event Fields parking area and turn right, continuing to follow Weeks Hill Road up to where it Percy Hill Road. Carefully park in the shoulder on Weeks Hill Road before the intersection, and walk up to this corner for excellent views of your runner(s) climbing Percy Hill Road, and continuing on up Weeks Hill. Give them a much-needed energy boost! By mile 7, runners are finished with the large climbs and descents on the course and are now running on the flat road/path by the West Branch Little River. Thompson Park, which provides a dozen or so parking spaces, is a great place to park and watch your runner turn on to the Stowe Recreation Path. The river provides a stunning backdrop for Fall running photos and enjoying the scenery while you cheer! Near the Mile 8 water stop, another small parking area is a great opportunity for spectators to make a final cheering section before runners make the last push to the finish. 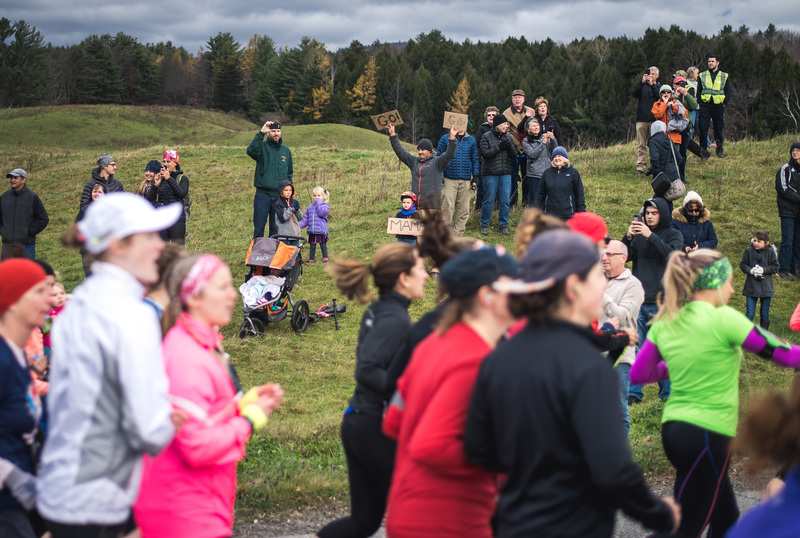 Runners will be settled into their flat-road pace and enjoying the Stowe Recreation Path, so expect to see a lot of smiles here as they take in the gorgeous Vermont sights! Port-a-potties will also be at this water stop, for those in need of facilities. There’s simply nothing more inspiring than a road race finish line! Runners and walkers from around the country will be completing this challenging course, collecting their finishers medals and celebrating their accomplishment. The finish is at the Mayo Farm Event Fields, across the street from race parking, behind The Swimming Hole. Ample parking is available, and we will have parking staff to guide you in and out of the lot, but we ask that all drivers practice patience and vigilance while we move hundreds of cars out of a small space.